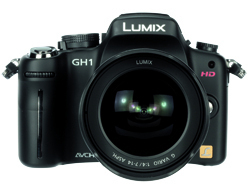 Panasonic has updated the firmware for its Lumix DMC-G1 and DMC-GH1 cameras. Firmware update v1.2 aims to improve AF performance for the subject in ‘low contrast’ and the ‘stability of auto exposure’ for Panasonic’s recently released Leica 45mm f/2.8 Macro lens. ‘The GH1 firmware v1.2 also decreases the operation noise of auto focus in motion picture recording for the 20mm f/1.7 pancake lens,’ claims the firm.